Are mass shootings on the rise in the United States? In a recent post, I noted that support for gun control is at an all time low in the United States. This might seem surprising given the recent spate of mass shootings. Indeed, there seems to be another tragedy almost every month. Based on the attention allotted to these incidents by the media, one might conclude that mass shootings are on the rise. But is such a trend borne out in the data? In a new paper, Blackman and Baird review the evidence on mass shootings and attitudes to gun control in the United States. They conclude that, "contrary to what the zeitgeist may suggest, mass shootings are not on the rise." The graph below plots the number of mass shootings each year in the United States between 1976 and 2011. (Here, 'mass shooting' is defined as an event in which 4 or more people were killed by a single individual with a firearm.) 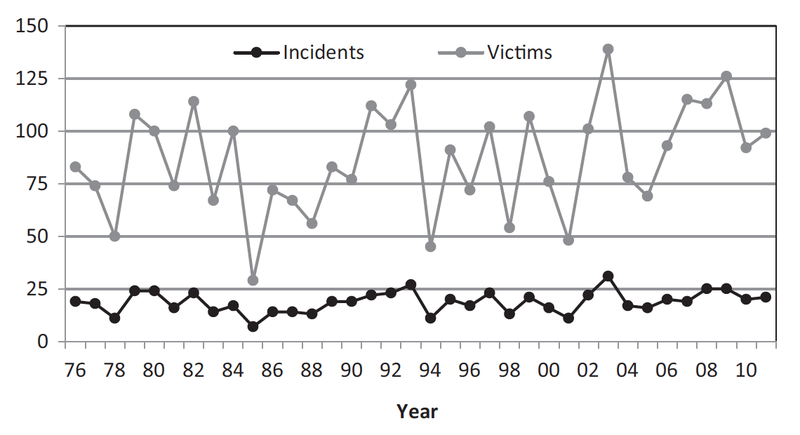 The number of mass shootings per year has remained remarkably constant at around 20. Since the U.S. population has increased by approximately 40% since the late 1970s, on a per-capita basis, mass shootings have actually been in decline.